Free two-day shipping, enormous selections, quick and easy shopping, painless returns, and many other factors have propelled online shopping to become the main driver of growth in retail. So, where does that leave the role of the physical store, now and in the future? Here we look at how retailers are innovating to leverage the unique advantages of the physical store. E-commerce continues its relentless rise, becoming an ever-larger percent of retail sales. As shown in Figure 1, it grew from about 2.5% of all retail sales 10 years ago to above 8% this year. When excluding auto and gas sales, online sales are more than 10% of all retail. 2015 was the sixth consecutive year that U.S. e-commerce sales increased by more than 14%. E-commerce has become the primary driver of growth in retail, accounting for 66.4% of total retail sales growth last year. This trend is expected to continue for the foreseeable future. At the same time, Amazon and others are offering ever faster and ever less expensive (or free) shipping. They continually improve the online shopping experience. For many kinds of products, online shopping has become the preferred approach for a lot of people. Experiences—Real, engaging, physical settings and experiences are something that humans highly value and that online sites cannot match. 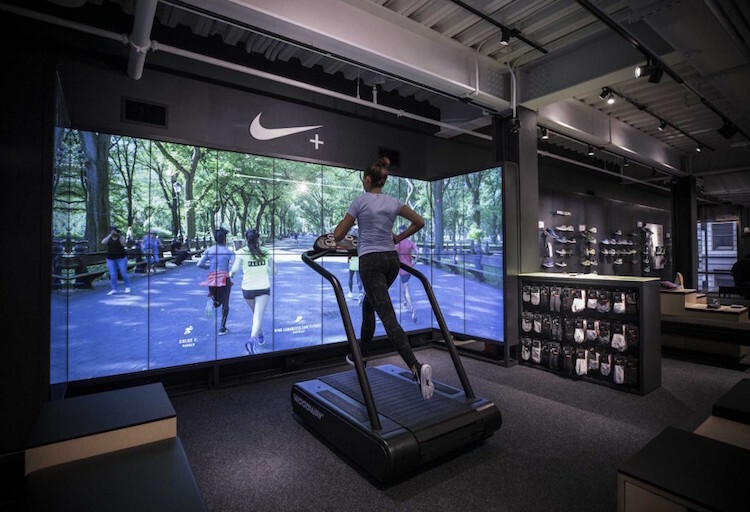 While successful retailers have fretted over the details of the shopping experience since the dawn of retailing, many are taking in-store experiences to a whole new level. Some stores are looking more like art galleries, or theme parks, or guided museums, rather than merely a place to shop and find/buy stuff. In-store events, such as concerts, fairs, classes, book signings, and celebrity appearances are being used to draw in shoppers. Here we see a lot of creativity and new things being tried out. Ideally, shopping and buying is interwoven with the experience. This article will focus on examples of new store experiences. Expertise—In many cases, shoppers are looking for someone with expertise to help guide them. The classic example is the do-it-yourself project, such as remodeling your kitchen. Having someone that can walk you through the whole thing, help you understand what you’ll need, ask intelligent questions to better understand your situation and needs, guide you through the decision processes, and provide advice and tips for success, can be immensely valuable to the shopper. While these types of services can to an extent be offered over the phone or via chat online, nothing beats a face-to-face dialog, especially for complex shopping that requires showing, touching and feeling the products, lots of explaining things, and a large amount of back and forth dialog. While competent experts can be a powerful differentiator, it is challenging to reliably train and retain associates who have a consistently high level of knowledge and ability to share it with customers. Showrooms—There are many types of products that need to be seen, touched, heard, felt, or tried on before buying. Everything from mattresses to home theater systems, shower heads, fine clothing, cars, furniture, and much more. Some of these are successfully sold online, but usually with a return rate that is 3-4 times (or more) higher than in-store purchases. Stores have an advantage for products that people want to try before they buy, but one challenge is how to secure the sale once a decision is made, especially if the person is not in a hurry and finds it for a significantly lower price online. At least one retail chain is experimenting (so far successfully) with a new business model where suppliers pay the retailer a small amount whenever shoppers engage with their products in the physical store (for more on this, see b8ta Reinventing the Retail Business Model). Fulfillment—Stores are often touted as a sort of distributed network of mini-warehouses that can be used to fight back against Amazon and other online retailers. Retailers are discovering the challenges of picking, packing, and shipping from stores … or alternatively picking and holding items for in-store pickup. Stores’ physical spaces and the systems used to run them have not been set up for optimal fulfillment. Much work remains to be done to get the right model for fulfilling from stores. In this issue of the brief, part two of Where Is Your Omni Strategy Now? touches on approaches retailers are taking to omni-channel fulfillment challenges, including in-store fulfillment. Montblanc emphasizes experience in all their boutiques. Its largest concept boutique, in Sanlitun Beijing, is like going to a combination museum and contemporary art gallery. 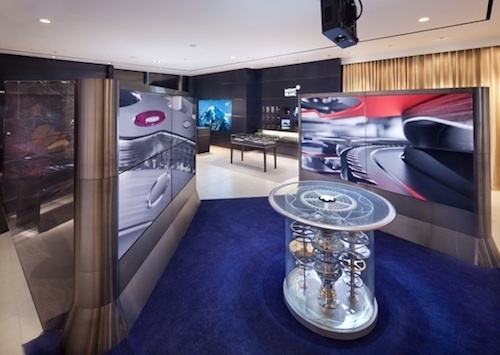 Visitors are given a red-carpet experience and a tour of Montblanc’s history, with various ‘time capsules,’ guided by handheld electronic audio devices. Their ‘Virtual Timepiece’ lets visitors experience the inner workings of a swiss watch. 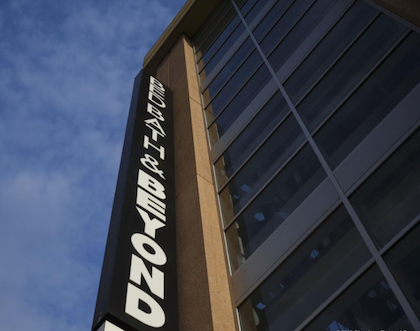 Bed Bath & Beyond’s upcoming 120K S.F. store in Liberty View Industrial Plaza (Sunset Park, Brooklyn) will feature a restaurant called Bay Market Kitchen in a large common area at its main store entrance. The restaurant will serve wine and beer. They will also have cooking classes, a “Born in Brooklyn” corner with products made in Brooklyn by local manufacturers, and a coffee bar serving Toby’s Estate brew. 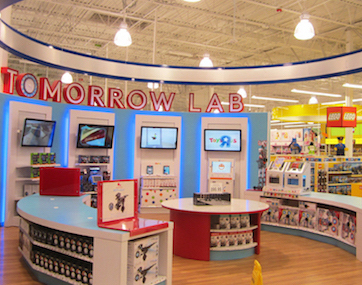 Toys“R”Us is opening four interactive, experience-driven stores this year, modeled after their experimental Toy Lab store. The first of these four stores opened in Santa Ana earlier this month. The stores will feature a play lab for kids to test out new products, motion sensing lights, a Lego section set up like a mini Downtown Disney Lego store, other branded sections for American Girl, Star Wars, and other brands, sound effects, and hosting of more events such as birthday parties and Pokémon trading. 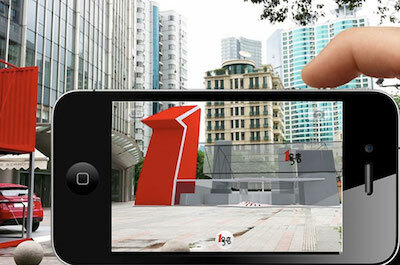 In the category of creating a store where there isn’t one, Yihaodian, China’s largest online grocer, is ‘opening’ 1,000 virtual stores in empty parking lots and parks, by using augmented reality (AR). The stores are only visible when viewed in a smartphone or tablet using Yihaodian’s app. The user can see an entire grocery store in the empty space, walk around the aisles, and select items by tapping them on their screens. The groceries are then shipped directly to the consumer’s home. Nike is opening a 55,000 S.F. "retail experience" store in New York’s chic SoHo district. 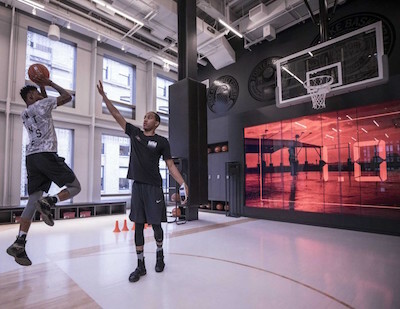 The five-story store has different areas where athletes can try out product in simulations of real-world conditions, such as a basketball half-court (with 23’ ceilings) that has a gaming engine to take players through a series of drills; a 400 S.F. glass-enclosed soccer ‘field’ with artificial turf for testing out cleats; a treadmill with large video screens for a run through Central Park; as well as video screens for different settings and real-time tracking; and ‘The Lounge,’ a special area for women athletes. Then there’s STORY in New York City, who describes themselves as “a retail concept that takes the point of view of a magazine, changes like a gallery, and sells things like a store. That means every four to eight weeks, STORY completely reinvents itself—from the design to the merchandise—with the goal of bringing to light a new theme, trend, or issue.” They have highlighted different themes in different ‘issues’ of their store/magazine such as ‘Remember When,’ ‘Making Things,’ ‘Wellness,’ ‘Color,’ ‘Love,’ and ‘Made in America.’ This creates an experience of discovery and exploration for shoppers, and keeps them coming back for more, to see what’s new. Starbucks was founded on providing a differentiated experience, welcoming people to stay and hang-out with free Wi-Fi, friendly baristas, interesting naming, varieties of coffees, and unique store settings. Recently they have been taking it to another level with their roasteries (or by its full name, Starbucks Reserve Roastery and Tasting Room) where coffee aficionados can watch the whole roasting process being done, in addition to ordering specially prepared brews (such as their siphon brewing option). Starbucks recently announced the first international roastery, a 30,000 square foot store in Shanghai. That’s about 20 times the size of an average Starbucks and twice the size of the original roastery concept store in Seattle. They said it will cater to Chinese tastes and sensibilities. 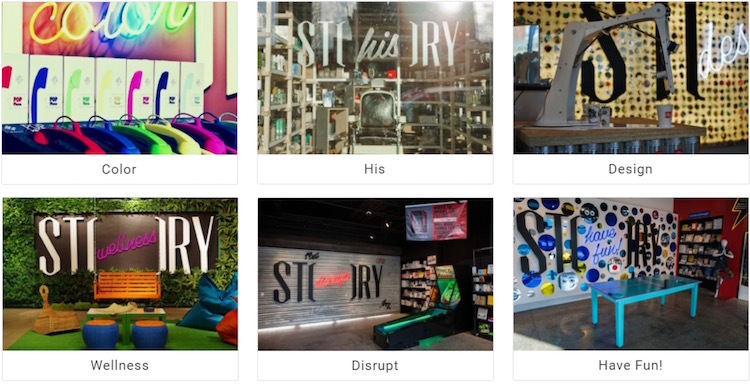 These are just a few of the examples of retail chains that have upped the ante on in-store experiences. In writings about ‘The Experience Economy,’ Pine and Gilmore argue that as products become commoditized over time, high margins can only be maintained by offering unique and fulfilling experiences. This is an area where physical stores have a big advantage over online or virtual venues. Unique and captivating experiences that draw in and keep people in their stores, and persuade them to make purchases, can be a powerful weapon against the low prices and ever cheaper and faster fulfillment from online giants like Amazon.